When I click to change the sound notification #1, I have the notification ringtones directly provided by the phone manufacturer. 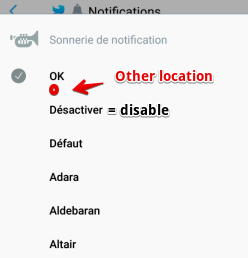 I can't go to a folder, select an audio file for notification ringtones. You would need to add a menu entry to search in another location on the phone , example SDcard or "download" folders, "music" folders, to be able to set up an MP3 music file. Thanks for your opinion. I'll consider adding it. Thank you for your answer. Today I am limited with the manufacturer's notification ringtones and I would like you to add this possibility to select an MP3 file. Thanks again and there's no "emergency"!